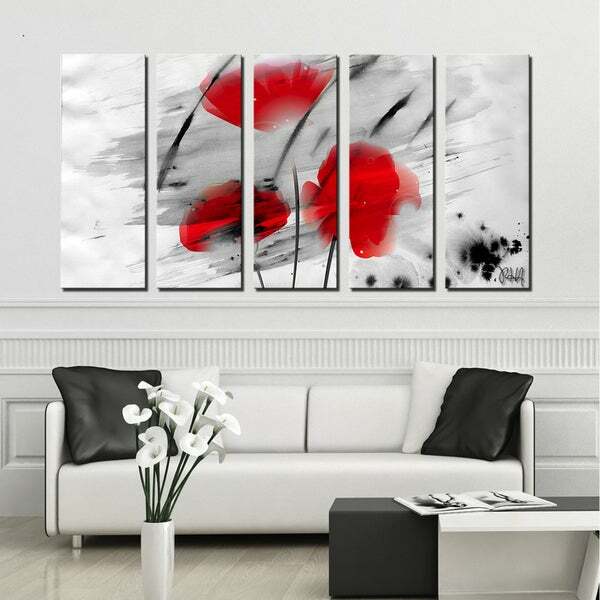 The 'Painted Petals II' canvas art depicts the boldness of flower petals as vivid red blossoms flare through a grey ground. This canvas features a modern floral & still life style and is gallery-wrapped for a look that will be cohesive with your home decor. Ready2HangArt is a USA based vertical decorative art firm seeking to enhance people's surroundings with innovative designs, extraordinary quality, and unparalleled value. R2H makes #decorating simplified. This splendid piece of wall decor will enliven your home. Made in the USA from US and imported parts. Soft grays in background with bold red splashes of red and black. The black and grays coming through the red is beautifully done so red has softer "see through" feel. The color follows around the canvas on all sides...Definitely worth the price. Also, the item came within 4 days and was packed very well. I wasn't sure about a five piece of art. I thought that I would at least wait to see the quality of the art. After receiving the item, to my surprise this art set was better in person. This piece of art have options for the layout with is great for my huge wall. This product looks just like the picture on line. The quality is not what I expected for the price. However it’s a perfect match for my decor. In the picture it shows a bright white canvas. What you really get is something that looks more lavender. Disappointing. Hooks were crooked in the back as well making it impossible to hang straight.